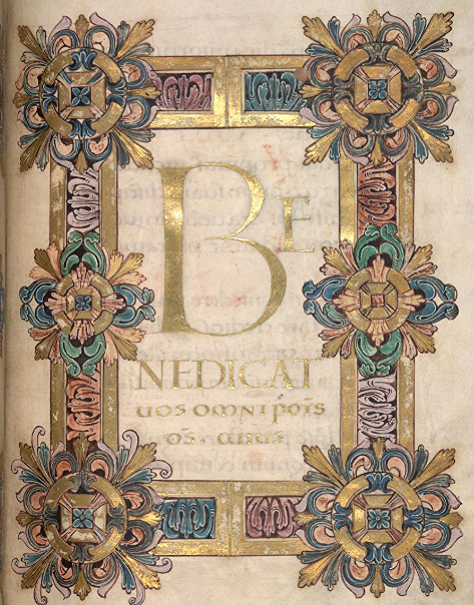 Last Advent I posted a series of extracts from the Old English poem known as Christ I, which is a poetic meditation on the 'O Antiphons' (the series begins here). 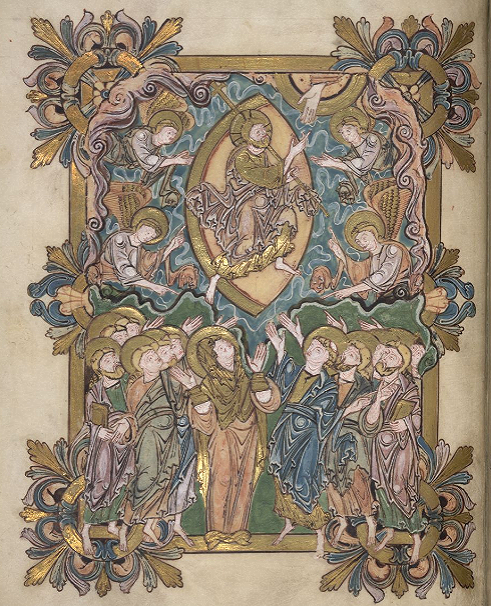 The poem which follows Christ I in the manuscript is known, logically but unimaginatively, as Christ II, although the two poems were probably composed at different times and by different people (the second is signed by Cynewulf, one of the few Anglo-Saxon poets whose name we know). Christ II deals with the Ascension, and so it seems appropriate to post a few short extracts from it today. All three Christ poems can be read in Old English here; the following translations are mine. strengðu staþolfæstre on stowa gehware." on þam þingstede, þegnas gecorene. þe of þæs hælendes heafelan lixte. in that meeting-place, the chosen thegns. God's Son from the ground. which shone from the Saviour's head. Hence it is that Solomon has put into the mouth of the Church the words: Behold, He cometh! leaping upon the mountains, skipping upon the hills. When He came to redeem us, He came, if I may so say, in leaps. My dearly beloved brethren, would you know what His leaps were? From heaven he leapt into the womb of the Virgin, from the womb into the manger, from the manger on to the Cross, from the Cross into the grave, and from the grave up to heaven. Lo, how the Truth made manifest in the Flesh did leap for our sakes, that He might draw us to run after Him for this end did He rejoice, as a strong man to run a race. Therefore, dearly beloved brethren, it behoves us in heart and mind thither to ascend, where we believe Him to have already ascended bodily. heah ond halig, ofer heofona þrym." So the beautiful bird ventured into flight. ealle eorðbuend, þurh þone æþelan styll." eadgum ece gefea æþelinges plega. mid usse lichoman, lifgende god. synwunde forseon, ond þæs sellran gefeon. of his brægdbogan biterne stræl. endlessly delighted in the Prince's play. with our bodies, the living God. the wounds of sin, and delight in what is better. a bitter shot from his deceitful bow. This Christ is dynamic, full of joy and energy: everything that happens in his life is propelled by his triumphant vigour, even his 'rush' (ræs) towards the cross and the moment he chooses to relinquish it (þa he þone beam ofgeaf). His Ascension is not a passive lifting-up into heaven but an active bound towards his homeland (again, compare the Christ of the Benedictional of St Æthelwold; he's definitely leaping into heaven!). His leaps are called plega, 'play', movement as swift and natural as the play of fire or light, and the Ascension is hyhtplega, a beautiful compound: hyht is both 'hope' and 'joy', so this is 'a play of hope', 'an action which brings joy' to us and to the laughing angels, who spend eternity delighting in the 'Prince's play' (æþelinges plega). halge on heahþu, þa he heofonum astag. holy in the heights, when he ascended into heaven.